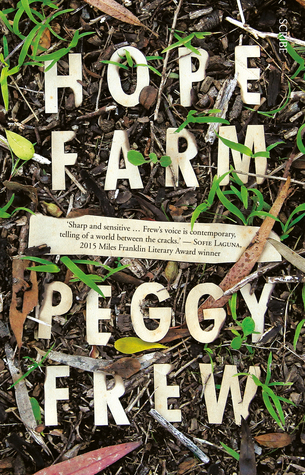 Hope Farm is Peggy Frew’s second novel, and it’s longlisted for the 2016 Miles Franklin Award. (See the rest of the longlist here). Although its setting is a hippie commune in decline, it’s an elegy for kids brought up in dysfunctional circumstances anywhere. Silver, looking back on her childhood and the traumatic events of her thirteenth year in 1985, narrates most of the story, with interleaved excerpts from her mother’s memoir filling in her own backstory. Her mother is Ishtar née Karen, who embraced the communal lifestyle when at seventeen she became pregnant and it seemed like the only alternative to giving up her baby. Their subsequent life involved trailing around from one commune to another, Ishtar chasing the love she didn’t get from her parents when she needed it, and Silver – initially the sole object of Ishtar’s love and attention – gradually becoming wise beyond her years as she observes her mother’s immaturity fracture their relationship. By the time they get to Hope Farm in rural Gippsland, Silver has become inured to neglect and squalor, and she absorbs with stoicism the taunts of her schoolfellows at each successive school. She longs for a stable home but has no illusions about her mother’s latest boyfriend, Miller. He makes a noisy entrance to the commune and spruiks lots of grand plans, but he doesn’t even know enough about farming to recognise that a self-seeded pumpkin vine isn’t going to produce any pumpkins once the summer is over. He starts projects but lets them lapse, and soon he and Ishtar join the rest of the residents in a fog of inertia, booze and drugs. The sombre tone of the novel lifts just a little when down by the river one day Silver meets Ian, an outcast like she is. He becomes a friend, and they have some innocent fun together. But, subjected to vicious bullying at the school they both go to, Ian shares his strategies for survival because he recognises instantly that Silver will need them too. I swallowed. This school sounded rough. He went on, finger upheld. ‘And now for the third tactic. This one is equally as important as the first two, in fact it’s crucial, because it preserves morale. Predictably, things don’t work out with Miller at Hope Farm, and in a sign of potential self-rehabilitation, Ishtar rejects the attentions of too-good-to-be-true Dan because at last she realises that she needs to build a life of her own that’s independent of men. The plot builds up to a dramatic climax which fractures everything, and eventually leads to rescue for Silver. But the damage is done and in adulthood she continues to use the strategies recommended by Ian, avoiding potential hurt, cultivating resilience by enduring loneliness and emotional distance, and yes, in a passive-aggressive way, avenging herself for her mother’s shortcomings. Hope Farm is compelling, but it’s depressing reading and the way the plot delivers a comeuppance to everyone that’s been ‘mean’ to Silver is a bit childish. Ishtar’s parents get their just desserts; Miller meets a violent end, and the farm is destroyed by stupidity as much as by the turn of events. Ishtar herself is despatched when she’s in her forties and the author can’t resist tacking on a suggestion that she brought it on herself. There’s a grim reality that none of this brings peace to Silver, but the combined effect of all this misery is nihilism. Hope Farm being the last of the books longlisted for the Miles Franklin Award, it only confirms my suspicion that the judges are fixated on novels about dysfunction, grief and misery. Kim at Reading Matters reviewed it here and so did Kate at Books are my Favourite and Best. See also Jessica Au at the SMH. Or direct from Scribe where you can also buy the eBook. I think I’d like the commune aspects of this but not so much the bullying (and what I think of as YA issues). I liked the attempt at analysis of the dynamics of communes, and think more could have been done with that if the characters there had been fleshed out a bit more and the story showed their PoV as well. But yes, bullying, family violence and child abuse are everywhere in Australian fiction at the moment. This ended up being a DNF for me as I just kept getting angrier and angrier at Silver’s mum (being perimenopausal has put me in touch with my inner rage in a way I’ve never experienced before – it’s rather liberating when it’s not overwhelming!) In this case I threw the book across the room in disgust since I couldn’t give Ishtar a piece of my mind! Thanks for your review and giving me some hints on how it finished up (I was enjoying Frew’s writing, so may have to try her earlier work instead). LOL, Brona, I think that’s a sign of very powerful characterisation if it made you feel so strongly about it!